The ring finally came out of my Cinnamon Pinecone Diamond Candle. It’s a pretty yellowish-green princess cut stone with small diamond-ish stones on either side of it. I really like it, but it’s too big. There aren’t any markings on it so I don’t know if it’s actually worth anything, but it’s still pretty. Now I need a new candle. Okay, so after seeing the commercial Ron kept suggesting I buy one of those Air Wick Color Changing candles. I figured it was some kind of hoax so it took me a while to bite, but I finally did. They are the coolest thing ever. I don’t really get how it works, but it does. I think it must have to do with heat, but as soon as you light the wick the candle starts glowing and changing colors. It’s pretty nifty. I’ll have to get another one because they’re that cool. They kind of stink when you blow them out, more so than normal candles, but I can overlook that. OK, so I need a little help with this one. I love Glade Apple Cinnamon candles and buy them when they’re on sale and I have coupons. A few months back, probably sometime during the holidays, Target had them on sale, plus if you bought a certain amount you got a $5 gift card. I love when Target has this deal (I’ve used it a ton of times) and I had coupons so I bought a bunch. 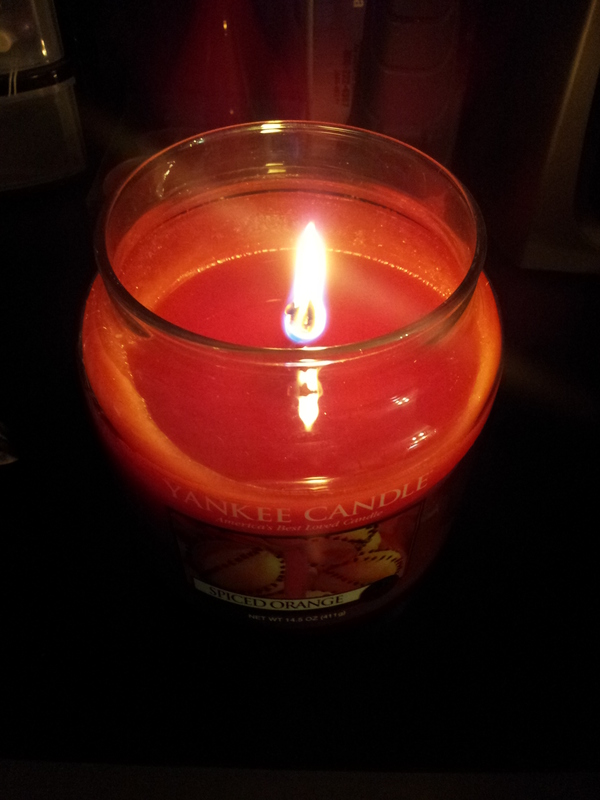 Long story short, I had some Yankee Candles and am just getting around to burning the Glade ones. Problem is, I pulled one out tonight and lit it and it doesn’t smell like they usually do. This one barely smells at all and it’s losing its color at the top. Has anyone else had this happen? Did I get a bad one? Do they lose their scent if they sit too long? I need some help because I’ve never encountered anything like this before. I’ve officially given up on my Vineyard Yankee Candle. I’ve tried to suffer through it, but it’s so sweet it makes me feel sick. I usually love Yankee Candles, but this one is terrible. It’s been replaced by a Cranberries and Frost Febreeze candle. They’re my favorite and only sold during the winter so I buy them and save them when they go on sale at the end of the season. Sadly, this is my last one, but it was worth it to get rid of the Vineyard smell. I like Yankee Candles, but Vineyard is not my favorite, not even close. It has a grape smell and I usually like the fruit scents, but this one is sickeningly sweet. It kind of takes over the room. I’m struggling through it, but I definitely will stear clear of this scent in the future. So a few months ago, I posted about my first real Yankee Candle. At the time, I was curious as to how long it would last. You can visit that post here. Well that was 60 days ago and my candle finally died. I’d say that was pretty good. I burned it everyday, usually lighting it when I got home from work, so I’m surprised it lasted that long. As long as I can keep getting coupons, I’ll probably buy more Yankee Candles, because they really are worth the money, on sale of course, if they last that long. Now, I’ve moved on the second one that I bought that day using a $15 off $45 coupon. When Ron and I went outlet shopping this weekend, I picked up some candles from Yankee Candle. I usually don’t buy them because they’re kind of pricey, but I had a coupon my mom had given me that was $15 off $45. I was able to get this large Black Cherry one and a medium Spiced Orange one. The cherry smells amazing. I haven’t lit the orange one yet. They’re supposed to burn a long time, so we’ll see. These Febreeze candles smell amazing. The whole room smells like Brazilian Dragonfruit. Mmm. I’m all for safety, but this seems a little extreme. 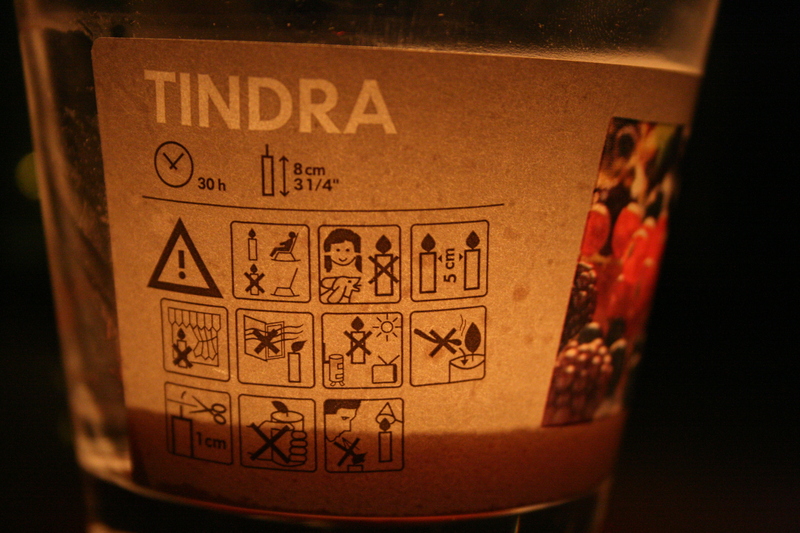 My candle from Ikea, referred to in typical swedish Ikea style as a tindra, has almost a dozen warning pictures on the label. Some of these I can’t even decipher including the one of the two candles and 5 cm and the one with the candle, a sun, some sort of water heater and a television. At first I thought the 5 cm one was indicating the wick should be trimmed, but that is represented by a different picture. As for the one with the sun, water heater and television, I’m guessing these are places you shouldn’t put your candle–not on top of a television or a water heater and not in the sun. That’s likely not correct, but I have no other guesses. Do you?